McKinely Ward is the winner of Wrangell 2018 Coho Salmon Derby. The Wrangell Chamber of Commerce brought back this fishing event this year. The last silver derby was held in 1996. Wrangell brought back the Coho salmon derby, the first time since the 1990’s. The competition replaced this year’s king salmon derby, which was cancelled this summer due to severe sport fishing restrictions. The friendly competition wrapped up last weekend. McKinely, or “Mack” or “Mackie”, Ward found out he won the competition Tuesday morning. The rankings are based on a person’s top three fish caught during the derby. Ward won weighing three Cohos totaling 37 pounds. He won a $2000 cash prize. Him and his dad, Lloyd Ward, run a construction business in town. 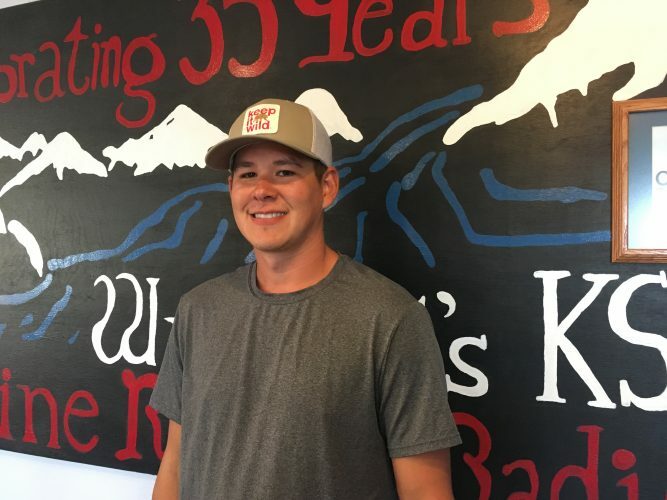 He’s always been connected to Wrangell, but moved to town five years ago. Even though Ward loves fishing Kings, he was feeling lucky once he heard about this year’s silver salmon derby. “Every since I moved here, I’m been knocking them dead on Coho,” Ward said. He says he’s caught 30 Cohos this summer. And 10 kings. Ward says he fished every day of the derby. That’s four weekends totaling nine days. “Coho’s are either there or they’re not. And when they’re there, they’re biting nonstop,” Ward said. But ask plenty of people, were the Cohos even there? “Well I traveled the seven seas and I completely went everywhere searching for where they’re at,” Ward said. So where were they? You know, since the Derby’s over. Ward reluctantly said his spot was Mulver Island, near Steamer Point on the backside of Etolin Island. I asked Ward when he knew he was a contender in this race. The runner-up, Lynsie Powers, missed Ward’s total by 1 pound. She won $1500. Marilyn Mork got third place with a 35.1 pound catch. She won $1000. Patrick McManus won the raffle for two Alaska Airlines round-trip tickets. The Wrangell Chamber of Commerce hosted the event. The Chamber says 106 fish were weighed in, and 256 derby tickets were sold. Organizers had hoped to sell 300 tickets minimum.